At AutoMax we have a wide range of America’s favorite muscle cars by Dodge, including the Charger and the Challenger, as well as the rest of the all-new lineup. Reliable sedans like the Dart and Avenger are great for drivers looking for a mix of economy and style, while the Journey, Durango, and Grand Caravan offer versatile options for those in need of a spacious family vehicle. Stop by our lot today and let our knowledgeable staff help you find the right Dodge model to fit your lifestyle. Explore the new Chrysler lineup right here at AutoMax. Whatever type of vehicle your lifestyle requires, we’ve got the Chrysler model for you. Whether you’re a family driver and need the interior space of the Town and Country, or you’re looking for the perfect model for cruising down the highway, like the Chrysler 200 Convertible, we can help you find the car that's right for you. Need a vehicle that combines the urban comforts of a crossover with the rugged performance of an off-road vehicle? Then come see the brand-new Jeep lineup at AutoMax, including new models like the Patriot and Compass, as well as reliable industry standbys like the Jeep Wrangler. Jeep vehicles are meant for rugged terrain but you don’t have to sacrifice comfort, making them the perfect option for adventurous drivers who need a vehicle for both work and play. Have you been looking for a Ram truck? At AutoMax we stock the full lineup of Ram models, from the Ram 1500 Big Horn to the 3500 Laramie Limited. Our knowledgeable sales staff can even help you pick out the right commercial trucks and vans for your needs. Ram trucks are built to handle any challenge you can throw at them, so come experience rugged hauling and towing power on a test drive today! If you’re looking for commercial models like the Ram Tradesman or ProMaster vans to add to your fleet, we are more than equipped to help. You need work ready fleet vehicles to make sure the job gets done, and Ram offers one of the toughest, most reliable commercial lineups in the industry. At AutoMax we have a number of lending and leasing solutions to help grow your business fleet, and our expert technicians can help keep your vehicles running great for years to come with service and maintenance solutions. Our goal is to make your car buying experience the best possible. 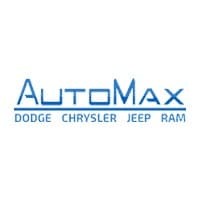 AutoMax Dodge Chrysler Jeep RAM’s virtual dealership offers a wide variety of new and used cars and trucks, Dodge, Chrysler, Jeep, and RAM incentives, service specials, and Dodge, Chrysler, Jeep, and RAM parts savings. Conveniently located in Shawnee, OK we also serve Oklahoma City, OK and Tulsa, OK. If you’re looking to purchase your new dream car, truck or SUV, you’ve come to the right place. At AutoMax Dodge Chrysler Jeep RAM we pride ourselves on being the most reliable and trustworthy Dodge, Chrysler, Jeep, and RAM dealer around. Our inventory is filled with some of the sweetest rides you’ve ever seen! We’re the kind of Dodge, Chrysler, Jeep, and RAM dealer that takes the time and listens to the wants and needs of our clients. We understand that buying a car is a process that takes a certain amount of careful consideration. It’s a lot to wrap your head around but at AutoMax Dodge Chrysler Jeep RAM we do our best to make the car buying experience an easy one. We’re the kind of Shawnee, OK car dealer that helps you decide exactly what you’re looking for. We won’t ever make a sale that our customers will end up being unhappy with. We’re proud to be the type of Shawnee, OK Dodge, Chrysler, Jeep, and RAM dealer that strives for 100% customer satisfaction. We are the Shawnee, OK Dodge, Chrysler, Jeep, and RAM dealership that caters to a whole variety of clientele. We understand that all of our clients have different financial situations and have done our best to ensure that our cars come in a variety of different shapes and sizes, and that their price tags vary as well. We not only have an amazing selection of brand new cars but have also acquired an impressive selection of pre-owned vehicles that are just as fantastic. Because our customers are so important to us, we’ll also take the time to find you some great financing options if you need them. At some point in our lives we all need a little financial boost, and at AutoMax Dodge Chrysler Jeep RAM we do our best to find a reasonable loan that enables you to purchase the car you’ve always dreamed of. If you would like to get in touch with us please don’t hesitate to give us a call at (888) 974-0688 or stop by for a visit at 4141 N. Harrison Ave, Shawnee, OK. 74804. Need Dodge, Chrysler, Jeep, and RAM parts in Shawnee, OK? Need to schedule Dodge, Chrysler, Jeep, and RAM service in Shawnee, OK? Schedule your next Dodge, Chrysler, Jeep, and RAM oil change in Shawnee, OK. Need Dodge, Chrysler, Jeep, and RAM brakes in Shawnee, OK? Everyone was very helpful, Mathew and Doc did a great job helping me the new truck I wanted!